Music Online - A cross-searchable index of various Alexander Street Press databases, including: African American Reference, Classical Music Reference, Garland Encyclopedia of World Music Online, Classical Scores Library, Smithsonian Global Sound, American Song, Classical Music Library, Contemporary World Music and the Jazz Music Library. Classical Music Library -Coverage includes music written from the earliest times (e.g. Gregorian Chant) to the present, including many contemporary composers. Repertoire ranges from vocal and choral music, to chamber, orchestral, solo instrumental, and opera." comprehensive collection of streaming jazz available online. Smithsonian Global Sound - It includes the published recordings owned by the non-profit Smithsonian Folkways Recordings label. It also includes music recorded around the African continent by Dr. Hugh Tracey for the International Library of African Music (ILAM) at Rhodes University as well as material collected by recordists on the South Asian subcontinent from the Archive Research Centre for Ethnomusicology (ARCE), sponsored by the American Institute for Indian Studies. American Song - The database includes songs by and about American Indians, miners, immigrants, slaves, children, pioneers, and cowboys. Included in the database are the songs of Civil Rights, political campaigns, Prohibition, the Revolutionary War, the Civil War, anti-war protests, and more. 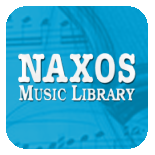 The library offers the complete Naxos, Marco Polo and Da Capo catalogues and recordings from dozens of other participating labels such as BIS, Berlin Classics, Opus 111, and many others. NML also offers recordings of contemporary jazz, world music and a host of online educational products. A not-for-profit resource providing CD quality audio, complete and original liner notes and essays from New World Records, Composers Recordings, Inc. (CRI) and other important labels. The main focus of the database is to provide access to 20th-century American music that is not otherwise readily available in recorded format.